Products designed to be placed on the floor or hung on a wall with a manually operated lid spring-loaded to the closed position. Several designs are available in different materials and finishes, with capacities ranging between 18 and 80 litres. With capacity for 55 and 75 litres, these models incorporate a manually operated swinging lid. This same lid allows to easily inserting the waste bag inside. Available in steel and white epoxy finish. With capacity ranging between 18 and 80 litres, all these waste bins have been designed to be supported on the floor or hung on a wall. 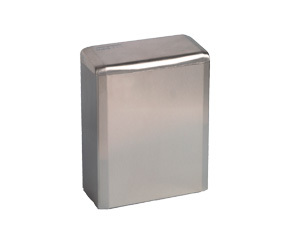 They are made of epoxy white steel or AISI 304 stainless steel, with a bright or satin finish. With several designs, finishes and a capacity ranging from 4.6 to 18 litres, all the models in this category may be supported on the floor or hung to a wall. According to the reference, we have bins with a double lid to ensure a better hygiene in the washroom. Available in a square or round shape and all have an anti-odour and quiet lid, a handle on top to facilitate transport and a black anti-slip pedal used for raising the lid. The capacity ranges between 3 and 20 litres. All these bins are made of epoxy white steel or AISI 430 stainless steel, with a bright or satin finish.